Amy Dawson Robertson. Anytime I see her name on my computer screen or on my copies of Miles To Go and Scapegoat – or anytime I hear her name – I have no choice but to smile. I met Amy in Provincetown in 2009. Oh, I was at the conference in Orlando that Amy writes about below. But that was my “sick as a dog” conference and I spent more time in my hotel room than actually at the conference. So, we didn’t get to meet. Anyway, there I am in Womencraft, waiting in line to get some books autographed – Karin Kallmaker was holding court and I was determined to get a few books signed – when I hear someone say, “You’re Carleen, right?” Now, mind you, just a day or two before, in Now Voyager, Lisa Girolami asked my name when she signed a book for me. Her response to me saying, “Carleen” was “Carleen?! Carleen Spry? THE Carleen Spry? !” So to have another person, sort of out of the blue, recognize me in some way was a little odd, to say the least. That right there was the beginning of a pretty awesome friendship with one Amy Dawson Robertson. 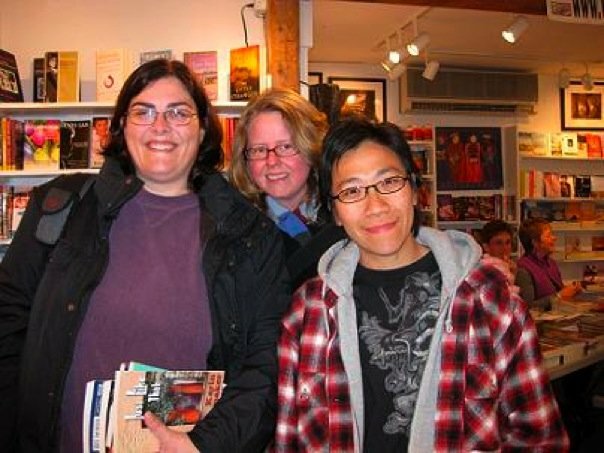 At that time, we were both fangirls – waiting in line to get autographs and a bit in awe of the people around us (Karin Kallmaker and Lee Lynch, just to name two). I had no idea at the time that Amy was soon to be a published author herself. And, boy oh boy, what an author! I had the honor of attending Amy’s first reading of Miles To Go at the Stonewall Museum and Archive in Ft. Lauderdale in early 2010. This time, I was in line to have Amy sign her book! My mom met Amy at the conference in 2010 and a love affair was born. Amy became Mom’s new favorite (mind you, I’m an only child). Mom saved seats for Amy at events. Mom went to panels that Amy participated in. Mom looked for Amy every chance she got. In fact, Miles To Go is the only work of Lesbian Fiction that my mother EVER read. Now, THAT is saying something. Mom had her own signed copies of Miles To Go and Scapegoat. Unfortunately, she never got to read her signed copy of Scapegoat. But I know that she’s read it now. And I’m sure she’s eagerly awaiting Amy’s next book. 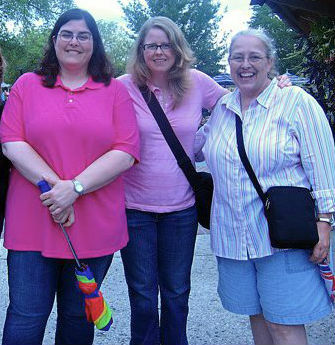 The first GCLS I attended was the 2009 conference in Orlando. In fact, every conference I have attended has been in… you guessed it, Orlando! I’m not really into Disney. And I don’t much like suffocating heat. But none of that mattered. I’d sold my first book, Miles To Go, to Bella Books in the fall of 2008. It was due to come out in early 2010. I was both ignorant and curious of the lesfic world at the time. But through the old Bella Forum – a vibrant messageboard populated by interesting and engaging women – I learned about the GCLS conference. It didn’t take long before I bought my ticket. I decided it would be good to figure out the lay of the land well before my book came out – and maybe there would be less chance of embarrassing myself. Suffice it to say, I had a great time. From the first day to the last, I met new people, learned new things at the workshops and ultimately felt embraced by the open and welcoming lesfic community. And that’s something that is perhaps the strongest and most important element about GCLS. In a world that is becoming ever more fractured and virtual, to have a place to come together face to face and experience real community is a special and ever rare thing. In fact, I have had such a great time at GCLS that I used it as a setting for my romantic novella, Midnight In Orlando (names, of course, have (mostly) been changed to protect the innocent). Fun. You will have a load of fun. From the meet and greet social on the first day to the pool parties in the evenings to karaoke to impromptu get-togethers in the hotel lounge. Last but certainly not least is the dance after the awards ceremony. You can dress up or down, dance or just gawk — regardless you will have a good time. Friendship. You will meet new friends at GCLS. It really seems almost impossible not to. Those who attend are just nice people, plain and simple. Learning. Whether you attend workshops where seasoned writers give a presentation on writing techniques or sit in on the coffee chats and panels where writers converse with one another and the audience about particular topics, the sessions are always interesting, informative and usually fun too. Books. GLCS ultimately exists to raise awareness of lesbian literature and to give writers and readers an opportunity to interact face to face. From a writer’s perspective it is a great opportunity to meet and receive feedback from readers and to meet colleagues. From a reader’s perspective, it is a chance to meet and get to know your favorite writers, have books signed and generally have a good time in a relaxed and fun atmosphere. And you can pick up a suitcase-full of new reads. The Author Auction (subtitle: what happens at the auction stays at the auction) Now this could have been included under fun because it is definitely fun. But it is SO fun that I think it deserves its own bullet point. The Author Auction is the main fundraiser for GCLS. Writers volunteer to be auctioned off for the first dance after the award’s ceremony. You never know what is going to happen at the auction but it is always, always hilarious and memorable. And if you’re willing to make a donation to a very good cause you may end up dancing with Karin Kallmaker or Georgia Beers or Bev Prescott or Jeanne Magill. And what could be better than that. Amy’s debut novel, Miles to Go, the first Rennie Vogel Intrigue, won a 2011 Alice B Committee Lavender Certificate for new writers. I love it when people say, “Are you Amy Robertson?” And I say, “No, I’m Pol Robinson.” *I* don’t think we look alike, you’re much better looking! But it gives me an excuse to point you out in a crowd. Can’t wait to see you again this year.